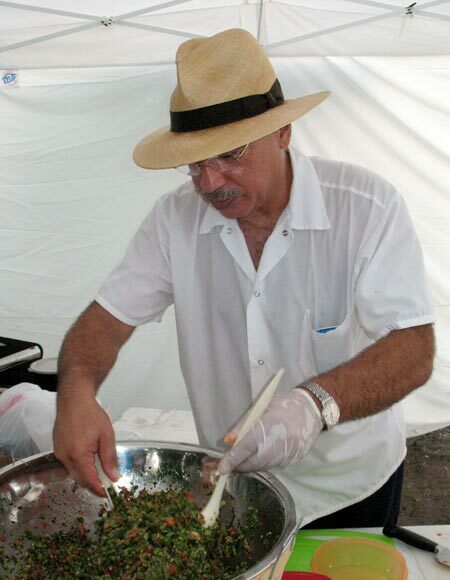 Hani Khouri tosses a fresh batch of tabouleh. You’ve seen him in his Panama hat frying up falafel at GrowFest and other events, or perhaps bought his goat cheese. But did you know that Hani Khouri is also a masterful chef who specializes in Mediterranean cuisine? Here’s a rare chance to take a cooking class with Hani and learn how to make three tasty dishes — falafel, tabouleh, and a goat cheese dessert. The event includes a buffet lunch, and all attendees will get a recipe book. Hani’s Mediterranean Organics sells organic hummus and baba ganoush, goat cheeses, and tropical fruit goat milk ice cream made with milk from his herd of free-range Nubian goats. His delicacies are available at the Pinecrest Gardens Green Market and through the Redland Organics CSA as an add-on share. Cost for the lunch/cooking class is $75 per person, or $60 per person for groups of four or more. Register and pay online at the Youth L.E.A.D. web site. All class proceeds go to benefit Youth L.E.A.D.’s food justice programming, which provides training and employment for low-income youth at farmers markets and community gardens.